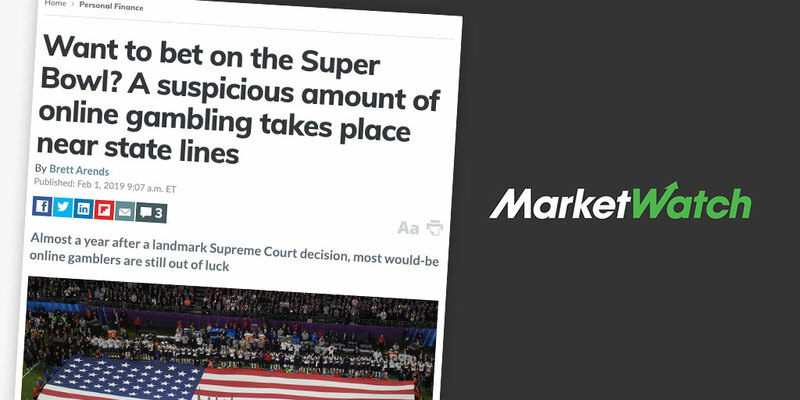 GeoComply’s CEO David Briggs interviewed for MarketWatch story on the role that accurate geolocation technology plays in the US sports betting industry. In a sports bar in Hoboken, N.J., your correspondent was able to download three gambling apps onto a smartphone and place real, genuine, actual money bets on the Super Bowl. Back across the Hudson River in Manhattan? Not so much. Nearly a year since the Supreme Court opened the door to legalized online sports betting, only a few states, including New Jersey and Nevada, have passed through it. In most of the rest of the country, it is still illegal. As your correspondent found, it seems to work as promised. It should prove good news for businesses, such as sports bars, just inside the states that allow the gambling. Within New Jersey, 44% of all online sports bets are placed within two miles of the state line, and 72% within 10 miles. Would-be gamblers from nearby states, such as New Jersey’s neighbors New York and Pennsylvania, are traveling over the line in order to place a bet. Chisholm says that within New Jersey, they’ve found about 44% of all online sports bets are placed within two miles of the state line, and 72% within 10 miles. There’s good reason for that, Briggs points out. If, say, a media company gets tricked by a virtual network into letting you stream content from a fake location, there aren’t any serious consequences. But if a New Jersey or Nevada bookie lets you place a bet from the wrong side of a state line, the executives can go to jail. The technology has to be waterproof. If a New Jersey or Nevada bookie lets you place a bet from the wrong side of a state line, the executives can go to jail. The battle over sports betting has been going on for decades. The Interstate Wire Act was passed in 1961 as a measure against organized crime, which at the time dominated the illegal gambling industry. In 1992, Congress passed the Professional and Amateur Sports Protection Act, or PAPSA, which effectively banned legal sports betting in most of the country. In 2006, the Unlawful Internet Gambling Enforcement Act launched an aggressive federal crackdown on online poker sites. The battle has pitted multiple interest groups against each other, including puritans who disapprove of gambling, those concerned with gambling addiction, established casinos, new operators, and lawmakers who want to squeeze the most government revenue out of wagering. “States view this as a great opportunity to increase their coffers without raising taxes,” says John Holden, business professor at Oklahoma State University. The only people who don’t have an organized lobby are people who just want to place a bet. The American Gaming Association, which represents the gambling business, guesses Americans will wager about $6 billion on this Sunday’s showdown between the Los Angeles Rams and the New England Patriots. About 20 states are looking closely at legalizing online gambling, but only a few are expected to make changes this year. But how much of this vast sum will be bet illegally? It’s a touchy subject. Maura Healey, attorney-general in the New England Patriots’ home state of Massachusetts, declined to comment on the record. But her press office cited cases where Healey’s office had prosecuted individuals for running illegal bookmaking operations. So far only a few states have legalized online sports betting, including New Jersey, Nevada and Delaware. Ifrah says about 20 others are looking closely at the topic but only a few are expected to make changes this year. “In 2019, we expect only four or five to pass laws before the summer,” he says. Those most likely to pass laws? “Most people are putting their money on Connecticut, Massachusetts, Ohio, Illinois and Michigan,” he says. Meanwhile, residents of many other states will have to wait. Legalization is going to involve political showdowns between those trying to introduce gambling, and vested interests such as Indian tribes with casinos, says Oklahoma’s Holden. In some states the battles will be bigger than in others. Among them: Oklahoma and especially Florida, where, he says, tribal casinos already generate hundreds of millions of dollars in revenue for the state government each year.